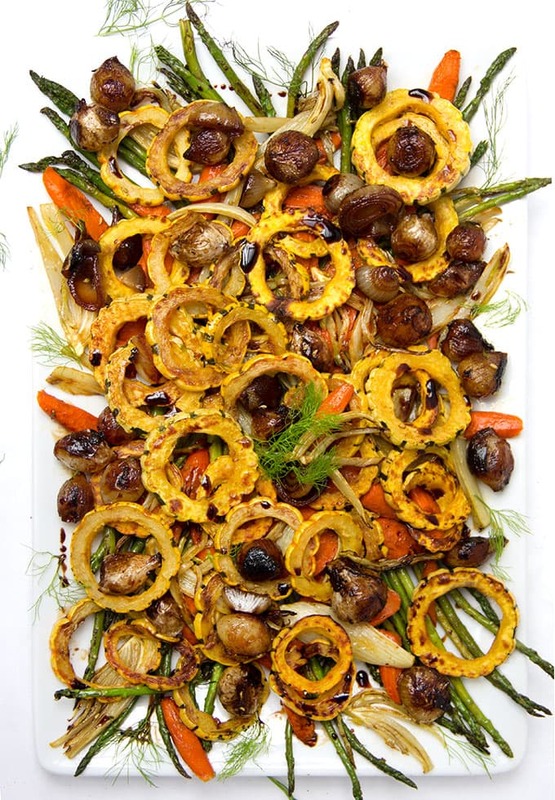 This Roasted Vegetable Antipasto is perfect for a festive occasion, with sweet and sour onions, seared asparagus, roasted carrots, fennel and rings of winter squash. In July my husband Eddie and I travelled to the beautiful Amalfi Coast for our 25th wedding anniversary. If you follow this blog you probably read about our Italian cooking vacation. We had cooking class every morning from ten till noon and then ate the delicious three or four course lunch that we had created. But that didn’t stop us from going out to dinner every night. One of my main goals when I travel is to find great restaurants and experience the local cuisine. I always return from vacation recharged with new cooking inspiration. We had some amazing food on our trip and I took notes (actually I took iPhone photos). This roasted vegetable antipasto recipe was inspired by a dish I had at a wonderful restaurant we discovered on our trip called Il Ritrovo. We found it through research on TripAdvisor: The best restaurants in Positano, Italy. Before we arrived for dinner at Il Ritrovo, we already knew we were in for a treat, after reading the stellar reviews on TripAdvisor. There were over 1,000 reviews and the restaurant had a TripAdvisor certificate of excellence, which is awarded to establishments that consistently earn great TripAdvisor reviews from travelers. We were also able to find tons of customer-posted photos on TripAdvisor, showing us previews of the food, the ambiance and the view. Il Ritrovo is perched 1,500 feet up the cliff from Positano, in the little town square of Montepertuso. It’s a charming restaurant with a stunning view down to the sea. 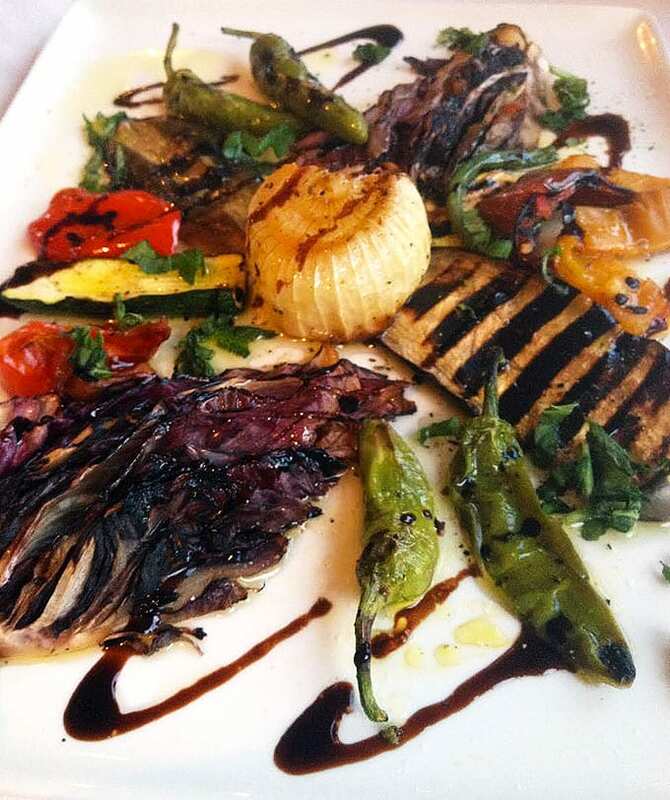 We ordered grilled octopus, eggplant parm and a grilled vegetable antipasto. Everything was outstanding but I have a thing for well executed vegetable dishes and I knew the antipasto (pictured below) would inspire me to make something similar at home. 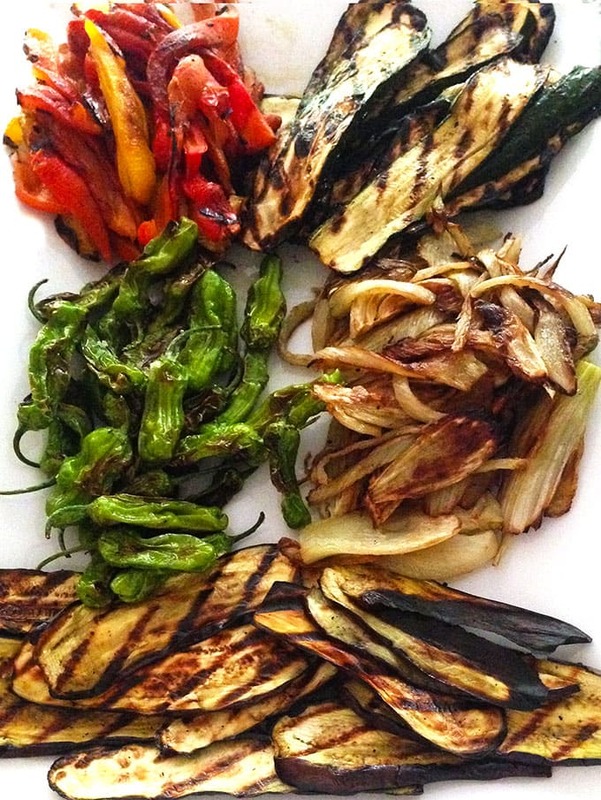 It was so rustic and simple – just grilled vegetables with oil and balsamic – but it was healthy and it had a fabulous assortment of vegetables. My first weekend back home here’s what I made for a casual dinner with friends (iPhone photo below) – my own version of Il Ritrovo’s grilled vegetable Antipasto (pre oil and balsamic drizzle). 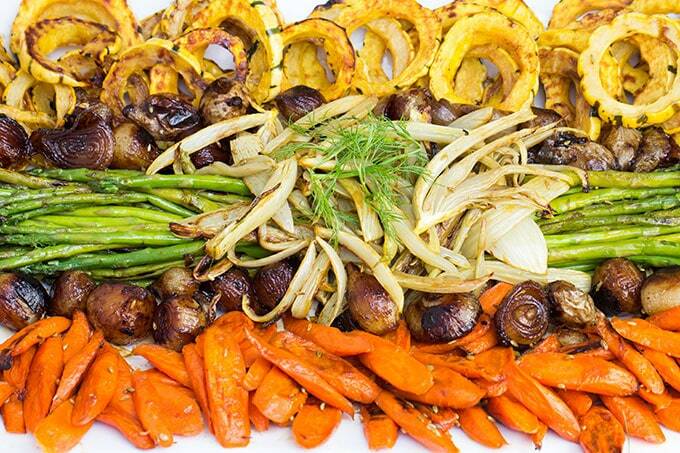 Now that fall is here and the market is bursting with every kind of squash and root vegetable I decided to create the fall-winter version – an Italian-style roasted vegetable Antipasto with squash, carrots, fennel, asparagus and onions. The centerpiece of the antipasto is scrumptious Italian sweet and sour Agrodolce onions. Small white onions are boiled for a few minutes and plunged into ice water, making it easy to pop them out of their skins. Then they’re sautéed in some olive oil. Once they’re brown and tender, sugar and balsamic vinegar are added to create a thick, caramelized sweet and sour sauce that’s the perfect counterpart to their oniony bite. The fennel is cored and cut into thin slices, tossed with olive oil and fennel seeds, and roasted with the carrots. 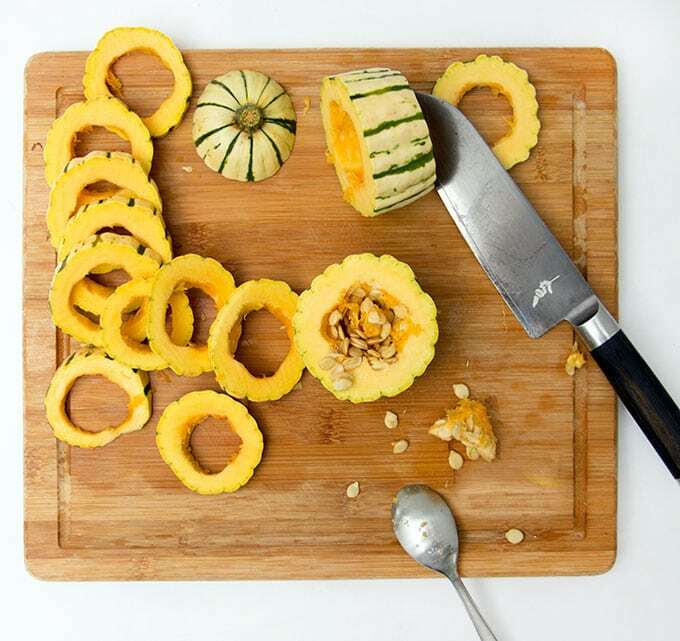 Delicata squash is a Winter squash aptly named for its delicate, edible skin. I love cutting into rounds – it looks so festive. I really got into arranging and rearranging the vegetables – so many possibilities! 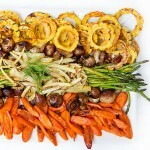 Wouldn’t this roasted vegetable antipasto be beautiful for Thanksgiving?! Do you ever come home from a trip and develop travel inspired recipes? It’s a fantastic way to keep great travel memories alive. I’m thrilled to partner with TripAdvisor on this #TravelToTaste campaign, celebrating travel inspired recipes. I hope you’ll join in too and post your travel meals on social media using the hashtag #TravelToTaste. Also please join TripAdvisor and me and other featured bloggers on Oct 28 (2pm ET) for a #TravelToTaste Twitter Party. Here’s the Roasted Vegetable Antipasto recipe. If you try this recipe, I hope you’ll come back to leave a comment and let me know what you think! 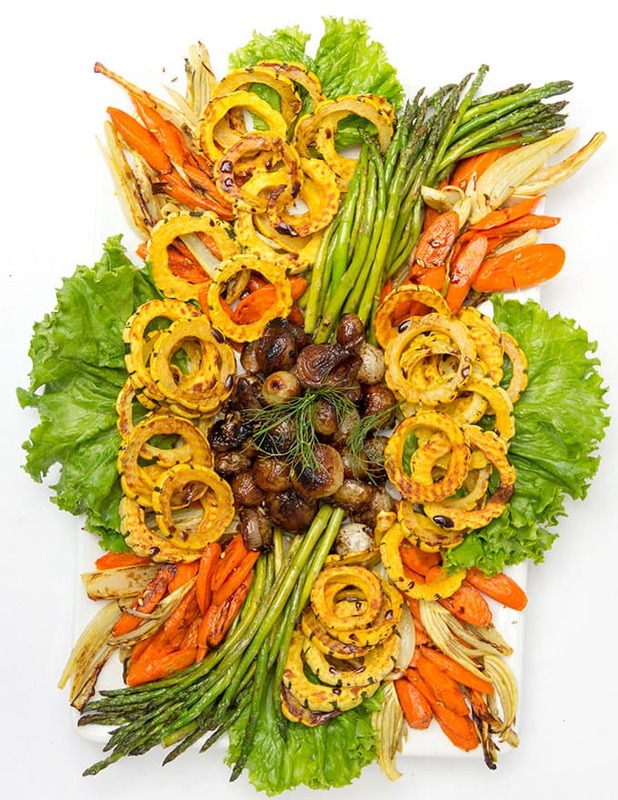 A festive Fall-Winter Vegetable Antipasto with sweet and sour onions, seared asparagus and roasted carrots, fennel and squash. 2 large fennel bulbs or 3 small, long stems and fronds removed. Save some of the frilly fronds for a garnish. 1 pound pencil thin asparagus (or as thin as you can find), washed and ends trimmed by an inch or so. Make the Agrodolce Onions: Fill a large pot halfway with water and bring to a boil. Put the onions in and when the water returns to a boil, set the timer for 2 minutes. (Note: if using tiny pearl onions boil for only 1 minute) Meanwhile prepare an ice bath by filling a large bowl with water and ice.Transfer the onions to the ice bath and leave them to cool for 5-10 minutes. 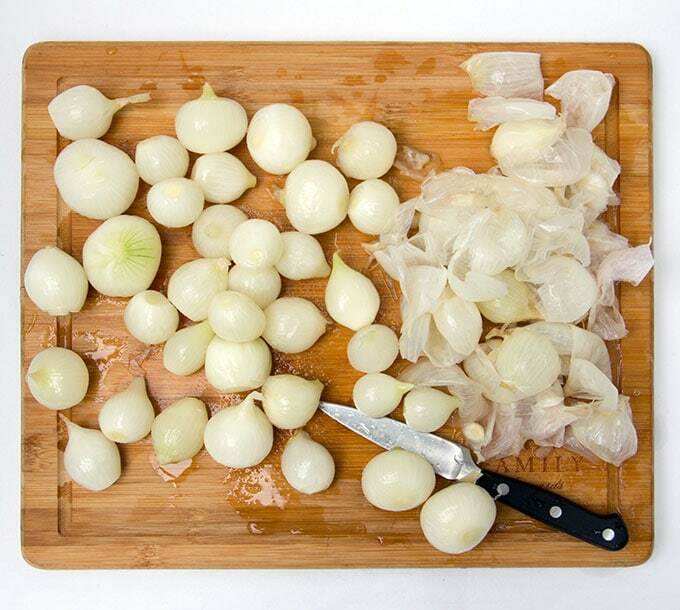 Transfer cooled onions to a cutting board. Slice off their root ends and give them a squeeze towards the top. They should pop right out of their skins. If you have trouble, make a little slice down the side. If any of the onions are a lot larger than the rest, slice them in half through the middle – not through the tip and root ends. Heat 2 tablespoons olive oil over medium high heat in a large heavy skillet with a lid. Add onions carefully because the oil will splatter. 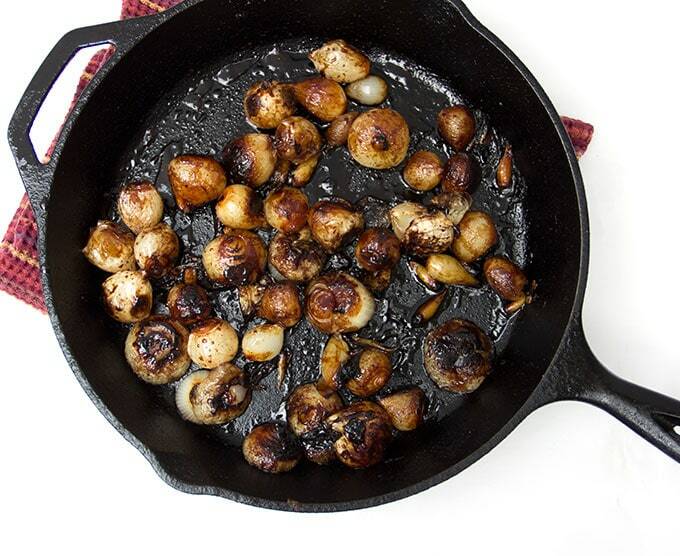 Sauté onions, partially covered to reduce splattering, for about 8 minutes, stirring occasionally, until they are softened and nicely browned on several sides. (Note: if you use tiny pearl onions the cooking time will be less) Add the sugar, 1/4 cup vinegar and 1/4 teaspoon salt. Continue to cook, uncovered, stirring frequently, for 3-4 minutes until onions are coated nicely with sweet and sour sauce. Transfer to a bowl and set aside. Roast the Carrots and Fennel: You’ll need a large bowl and two rimmed baking sheets. Preheat oven to 400ºF. Put the sliced carrots into the bowl. 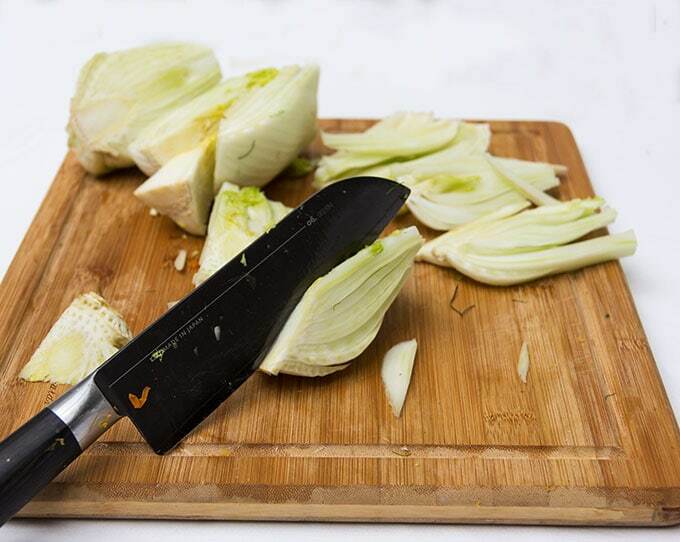 Cut the fennel bulbs in half lengthwise. Carefully cut out the little triangular core piece from each half. Then cut each half down the middle, through the hole where the core was. Pull off the outer leaf of each quarter, if it’s brown or bruised. Cut each quarter into 1/4-inch thick slices, lengthwise (see photo in the post) Put cut fennel in the bowl with the carrots. Add 3 tablespoons olive oil and 1/2 teaspoon salt and a few grinds of pepper. Toss to coat. Spread carrots and fennel pieces out into a single layer on two rimmed baking trays. Cook in the upper and lower shelves of the oven for 30 minutes, flipping the vegetable over with a spatula and switching the position of the trays halfway through. Transfer vegetables to a bowl. 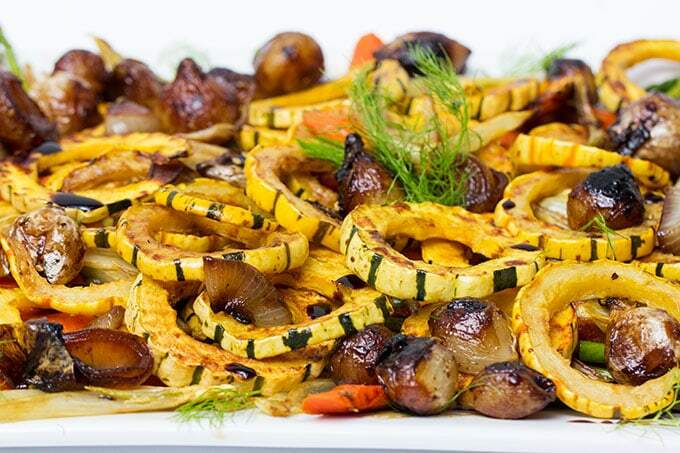 Keep the oven on and don’t wash trays – you’ll use them to roast the squash. Prepare and Roast the Squash: Lay the squash on it’s side and cut it in half through the middle – not through the root ends. Then slice off each root end. Scoop out the seeds from each half so you have two empty cylinders. Cut 1/4-inch slices across, making thin circles of squash. Repeat with the other squash. Put the slices in a large bowl. Add two tablespoons olive oil, two tablespoons balsamic vinegar or pomegranate molasses and 1/2 teaspoon salt. Toss to coat. Spread squash out into a single layer on the two baking trays and cook in the top and bottom of the oven for 30-35 minutes, until soft, flipping squash and switching the position of the trays halfway through. Cook the Asparagus: Spread 1 tablespoon olive oil over the bottom of a large skillet, and heat over medium-high heat. Cook asparagus, shifting and tossing them gently, for 4-7 minutes, depending on how thin they are, until they are bright green, crisp-tender, and browned in spots. Transfer to a plate. For very fat asparagus add a tablespoon of water, cover the pot, and let them steam for a few minutes after browning. Assemble the Antipasto: Arrange vegetables on a platter. Drizzle everything with 2 tablespoons olive oil and 2-3 tablespoons balsamic glaze or pomegranate molasses. Sprinkle with salt and pepper, to taste. Add fennel fronds to garnish. Serve warm or at room temperature. This post was created in collaboration with TripAdvisor. Opinions are my own, always. Beautiful for Thanksgiving! I don’t see an oven temperature. About 400? Thank you Claudia. Yes, 400. It’s listed in step 3. I hope you enjoy! Looks fantastic! 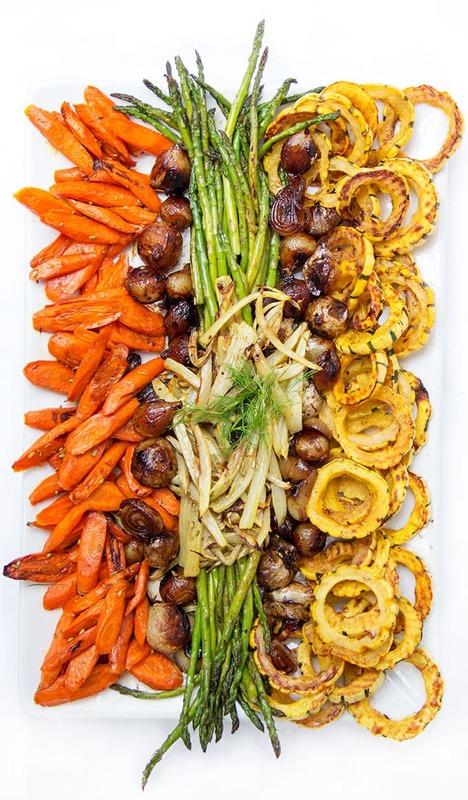 I want to make a large roasted veggie platter for my hubby’s birthday party this weekend, and this looks like the perfect recipe. 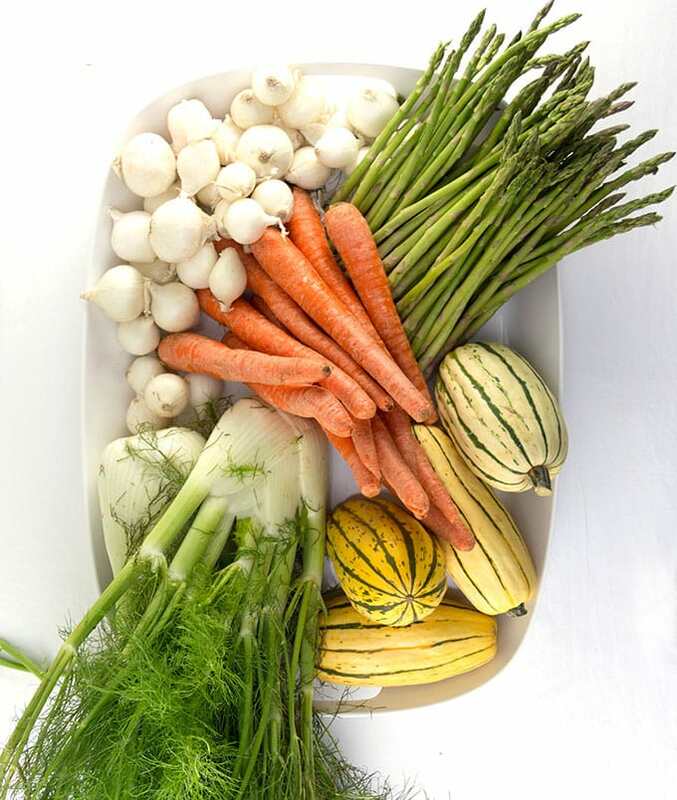 Question…could you roast the veggies a day ahead, store in fridge separately, and arrange on platter once returned to room temp the next day? Yes! You can most definitely roast the veggies ahead. I did that for my Thanksgiving this year and it was delicious! I hope you have a great party! Love, love, love the pics! I made this for a Christmas dinner side dish. I couldn’t find delicate squash, so I used sliced acorn squash. I made it a little ahead of time and served it at room temperature. It was beautiful and absolutely delicious. This will definitely become one of my go-to dishes. Thank you for sharing it. I’m so happy you enjoyed the antipasto Michele! Thank you so much for letting me know! 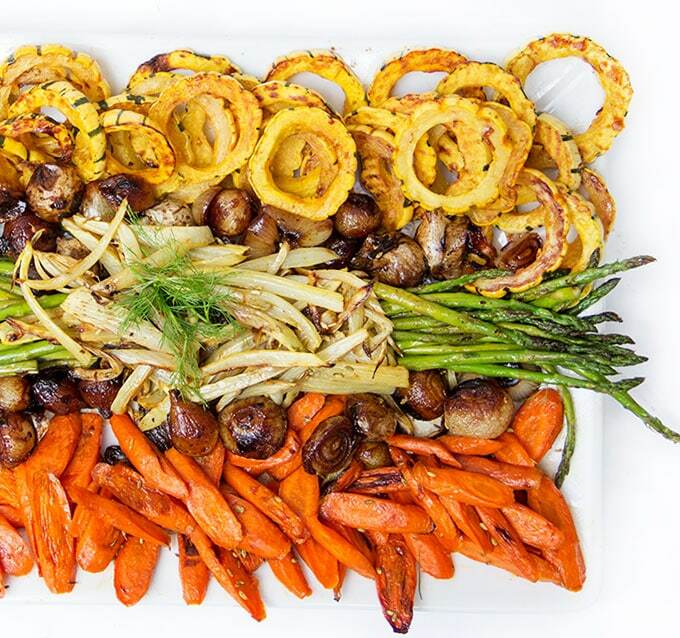 Lisa – This is such a spectacular array of roasted vegetables, it literally takes my breath away. And coincidentally, I bought some tiny white onions but haven’t used them yet – this may just make them the centerpiece of a copycat platter to serve for New Year’s Day. Just made this! Fantastic recipe – everything’s delicious and it looks gorgeous. Wish I could post a photo! I would say, however, that it took me more than two hours! I’ve never seen such a gorgeous, healthy platter of vegetables before. This is stunning! Oh my goodness, what a gorgeous combination of vegetables! I’m definitely trying this! Thanks Liz – I hope you enjoy it! Beautiful presentation and looks delicious!! Perfect for this time of year. How about yes! I am so making this for our next party. We have more and more friends going vegan, so this is perfect! Thank you, Lisa! Another GREAT recipe!! !